First New Models Assembled in U.S.A. Start Production this Month in Newnan, Ga.
CYPRESS, Calif. – May 18, 2011 – Yamaha Motor Corp., U.S.A., (YMUS) and Yamaha Motor Manufacturing Corporation of America (YMMC) announced today that the first production run of new all-terrain vehicle (ATV) models transferred to the U.S. from overseas facilities will take place this month at Yamaha’s state-of-the-art factory in Newnan, Ga. The start of new ATV production in Newnan is a major step forward in the companies’ long-term strategy to transfer the majority of Yamaha’s worldwide ATV manufacturing to the United States. When complete, the production transfer could add 200 or more American jobs at Yamaha’s U.S. factory as well as additional jobs at the 125 North American parts supplier companies. The specific ATV models will be announced on June 8 as part of Yamaha’s worldwide unveiling of select 2012 model year products. Yamaha’s ATV production transfer, first announced in early 2010, is a long-term strategy that will culminate in bringing the great majority of Yamaha’s worldwide ATV manufacturing to YMMC by 2013. The company has invested more than $250 million into the factory over the past 10 years creating a state-of-the-art facility and ensuring top quality products are built in a safe and environmentally responsible manner. Yamaha held a press conference at its factory in Newnan today where it announced the production transfer news. Yamaha executives and government officials spoke about the significance of the transfer and Yamaha’s manufacturing facility in the U.S. The company also unveiled a new “Assembled in U.S.A.” logo to illustrate its pride in U.S. manufacturing. As one of the largest motorsports companies in the world, Yamaha is a major contributor to the U.S. economy directly employing approximately 2,800 Americans and supporting more than 30,000 additional jobs through its manufacturing facilities, corporate offices, field staff, distribution centers, suppliers and dealer partners. 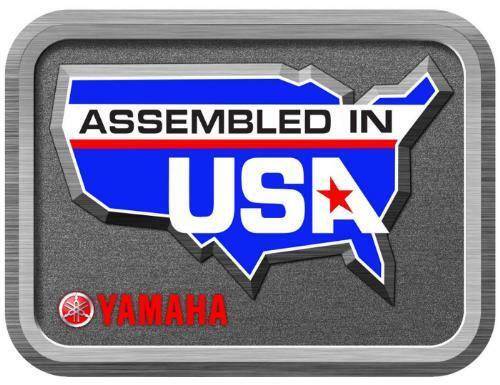 Overall, Yamaha has corporate offices, regional offices, factories and distribution centers in nine states including Georgia, California, Wisconsin, Texas, Pennsylvania, Tennessee, Illinois, New Jersey and Washington. The Newnan factory alone spends more than $170 million annually with 137 worldwide suppliers – 125 of which are also based in North America. This production transfer ensures that Yamaha maintains its loyal workforce in Newnan and will result in the hiring of more U.S. workers in the coming years. There are 90 positions at YMMC that are directly related to this year’s new production. The company currently estimates adding up to 200 additional jobs over the next three to five years based on other planned ATV model transfers to YMMC and market forecasts; however, the transfer has the potential to add as many as 800 to 1,000 jobs depending on market conditions. The factory currently employs more than 1,100 people in Newnan. Founded in 1986, the Yamaha Motor Manufacturing Corporation of America (YMMC) facility has the highest certifications for quality, safety and environmental manufacturing in producing golf cars, personal watercraft, Side-by-Side vehicles and all-terrain vehicles. The factory is ISO9001 Quality Management System and ISO14001 Environmental Management System certified. YMMC participates in both EPA’s National Performance Track Program and the Georgia Department of Natural Resources P2 AD Partnership Program. These voluntary programs were developed to recognize companies that have implemented strong environmental management systems. In return, participating companies are expected to continually improve their environmental performance through waste reduction, resource conservation, community outreach, and implementation of other sustainable business practices. YMMC’s involvement in these programs clearly shows its desire and commitment to go beyond regulatory compliance requirements in protecting and preserving Georgia’s natural resources. In addition, YMMC has received the Georgia State Natural Leader Award.